HomeDealsShopping I Think BIG I Think like an Entrepreneur! I Think BIG I Think like an Entrepreneur! I Think BIG I Think like an Entrepreneur. I am not just a Kid I am a Kidpreneur. I want to learn to achieve BIG Goals, shape my career and plan my future business! It’s Never Too Early. YOU! Dreaming Kids, join me at KidzMondo Doha at Mall of Qatar to be a KidPreneur. 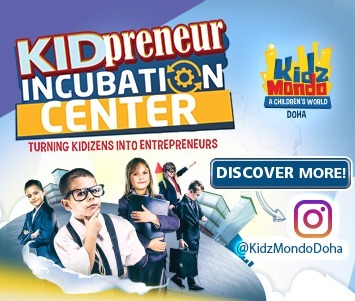 Kidpreneur incubation center, in partnership with QDB, Turning Kids to KidPreneurs For more information please call 40285888 Live the role, at KidzMondo Doha.